Find more fireplace related info on our hub page, and more information about how to heat your home in our guide. What to consider when buying an electric fire? There are two ways in which an electric fire can produce heat. The first is a forced fan, in which heated coils within the fireplace have air blown over them by a silent fan in order to push warm air out into the room. The second is the high-tech-sounding infrared quartz, where invisible infrared light heats up the things it comes into contact with, including as you and your living room furniture, rather than the air. Both of these methods leave everything except the element housing cool, so it’s easy to see why electric fires are often chosen over real ones for homes with curious pets or children. If you do have an existing chimney and fireplace, but would rather have the peace of mind of an electric model, you can purchase an electric fireplace insert which fits into place without the need for venting. If you prefer, or if needs must, you can go for an all-in-one unit with a mantelpiece or even a media stand. Size: as with buying a wood-burning stove, buying an electric fire requires a little consideration of your room’s size and the heat output it’ll need. The general guidance is that rooms up to 400 square feet will benefit from a forced fan electric fire, while bigger rooms up to around 1,500 square feet (at which point most heaters will start to struggle a bit), will be better suited to an infrared quartz fire. Style: for those with larger spaces, most styles suit; for smaller spaces, wall-mounted fires won't take up valuable floor space. Remote control: maybe not an important feature for some, but handy if you hate getting out of bed and into the cold every morning. Remote controls can be useful to have so you can turn it on from your bed, sofa or wherever you prefer, but if one isn't offered, it's worth noting how easy the controls are to get to. For those who are elderly, it's not ideal to be bending down the back of the fireplace to turn it off and on each time. Effects: arguably one of the most important features, choose whether you prefer a coal or fuel bed effect before purchasing. How realistic does it look, too? Some fires offer both effects, so you can change whenever you like, and have the best of both worlds. This traditional style electric fire has all the trappings of a rustic log burner, with its cast iron-look finish and double doors, as well as all the advantages that come with not having to deal with a real fire. It comes with two beds, one coal-effect and one log-effect, so you can switch it up based on your mood. It also features the industry’s most realistic flame effect, Optiflame, which can be used with or without heat. If you are feeling a bit chilly, there’s a choice of two heat settings controllable by remote, so you don’t even have to get out from under the blanket. Reviewers loved the realism, and it’s that, plus the ease of operation, that make it our best electric fireplace. 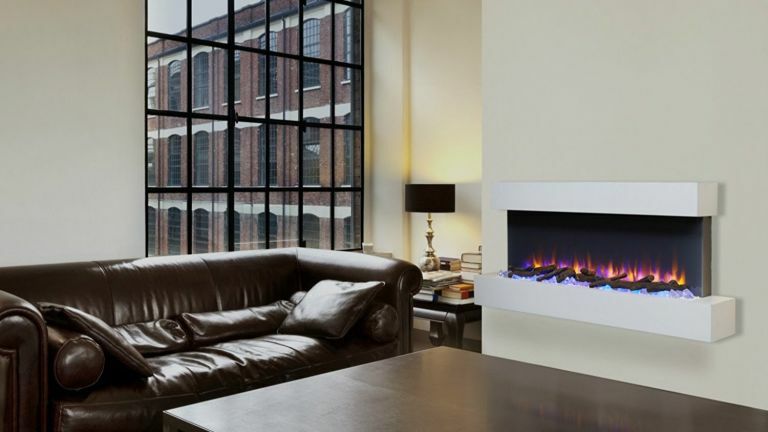 In a major departure from our first pick, this modern electric fire is one for contemporary living rooms. The black glass panel and elongated rectangular shape are clean, unfussy and elegant, and the low-profile wall mounted design means it can go anywhere you like. It’s an excellent one for creating atmosphere, as you can change both the brightness of the flame effect and the colour of the mood lighting that emanates softly from the back, and the easy-operate remote control means you can change it all, plus the temperature, from the comfort of the sofa. If you’re looking for the whole fireplace effect – that is to say surround, mantle and all – the Castleton model from Endeavour Fires is an elegant-looking choice with a versatile design to fit most spaces. The electric fireplace unit itself is supplied with a flat pack cream MDF surround which reviewers, even self-confessed DIY beginners, found incredibly simple to install, and loved the effect once they had. The light set into the surround is a little on the gimmicky side, but if you’re looking for a little extra ambience, it’s nice to have. If you're after an all-in-one unit, this is the best electric fireplace you can buy. The petite design of this electric fire means it needn’t be kept just for the living room – wherever you’re after an extra bit of atmosphere, a touch of warmth, or both, it’s sure to fit right into other rooms, such as the bedroom, thanks to its tiny footprint. Its traditional looks are ever so slightly more restrictive, but for a period-styled study or bedroom its real coal fuel bed and brass hardware are suitably grand. Some reviewers found a slight niggle in the fact that the controls are trickily situated under the hood, which might not make it the ideal choice for those who struggle with mobility, however all praised the realistic dancing flame effect and the superb value. Another one for modern living rooms, but this time less of a low-key heater and more of an art piece. This Endeavour Fires Runswick fire makes a beautiful focal point for a living room or sitting room, as it comes out further into the room than the low-profile Holbeck, and boasts a number of showier display options that set it apart from the more standard fare. With three different flame effects and 12 differently coloured log bed options to choose from, it’s a great option for those on the hunt for a modern twist on the classic fireplace with heating capabilities to back up the good looks. Galleon Fires pride themselves on the high-quality construction of their collection, with the Neos electric stove being no exception. Reviewers say it really looks the part with its realistic glowing log effect and log burner-like handle, and while it’s certainly among the most inexpensive options on our list, it doesn’t for a moment look – whisper it – cheap. It’s on the quiet side even while giving out its full 1.8kW of heat, and overall users are delighted, however some noted that replacement bulbs can be a little tricky to get hold of, so it’s worth sourcing some first. In our opinion, this is the best electric fireplace if you're on a budget.